With less than a week left before Leatherface will be available for DirecTV subscribers, and a month before the theatrical release, Lionsgate has debuted a new poster, which gives us our first look at the character who will eventually become the sadistic killer known as Leatherface. This one-sheet comes just a month after a particularly gruesome Leatherface trailer, which adds to the mystery of just who Leatherface really is. 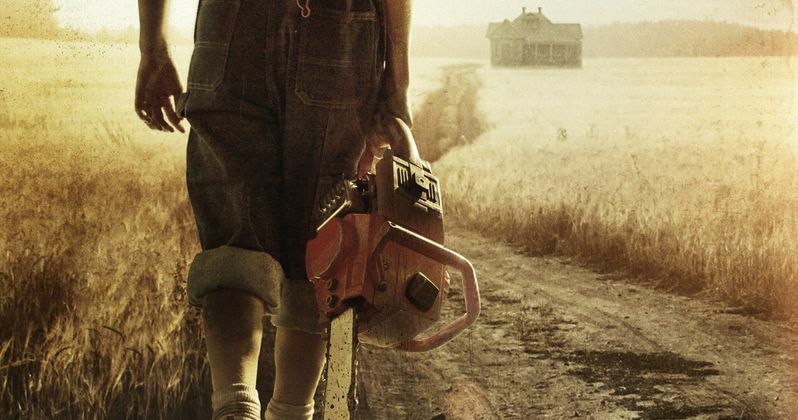 The poster doesn't reveal any obvious details, but shows the title character walking towards the Sawyer home, with a bloody chainsaw in hand. One of the most intriguing aspects of this Leatherface prequel surfaced last May, when a new Leatherface photo revealed Jessica Madsen's character, one of the four teenagers who escaped from a mental hospital and kidnapped a nurse. Since one of these characters will ultimately be revealed as the true Leatherface, there is technically a chance that this iconic killer could in fact be a young woman, but judging by the recent trailer, it certainly seems to be a boy. Then again, there could be some sort of crazy twist where it is actually the female character, although we won't know for sure until the film debuts on DirecTV next week. It will be interesting to see if the true identity is revealed by DirecTV subscribers before Leatherface hits theaters next month from Lionsgate. This story is set years before the events of the Texas Chainsaw Massacre, in the early days of the infamous Sawyer family, the youngest child is sentenced to a mental hospital after a suspicious incident leaves the sheriffs' daughter dead. The official synopsis for Leatherface also seems to rule out the possibility of the title character being Jessica Madsen's character Clarice, stating that "he kidnaps a young nurse and escapes with three other inmates," although it's possible that could be a ruse as well. After all, it wouldn't be the first time a movie lied to its audience in order to preserve a big twist. Stephen Dorff plays the deranged sheriff out to avenge his daughter's death, with Sam Strike (Jackson), James Bloor (Ike), Sam Coleman (Bud) and Jessica Madsen (Clarice) as the four teenagers who escape from the insane asylum, and Vanessa Grasse playing the nurse they kidnap to escape. The cast also includes Lili Taylor as the Sawyer family matriarch, Verna, with Iron Fist and The Defenders star Finn Jones also starring in an unspecified role. French filmmakers Alexandre Bustillo and Julien Maury direct from a screenplay by Seth M. Sherwood. Back in May, Lionsgate handed out a Leatherface release date of October 20, arriving in both theaters and VOD formats. While it likely won't get a wide release, it arrives in what will be the busiest weekend of the year, with five new movies opening in wide release, Warner Bros.' Geostorm, Lionsgate's Boo 2! A Madea Halloween, Sony's Only the Brave, Universal's The Snowman and PureFlix's Same Kind of Different As Me. It remains to be seen if any more footage will be released between now and the October 20 release date, but while we wait, take a look at this new Leatherface poster.